Size of baby: 14 inches long and weighs 1.66 lbs. Baby H is the size of an english cucumber! Total Weight Gain/Loss: Gained 15 lbs. 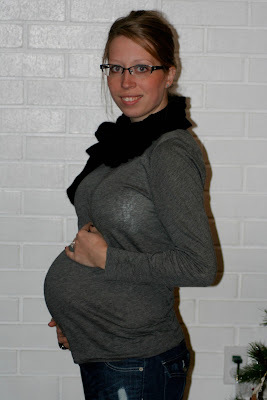 Maternity Clothes: are more comfy, for sure. What I miss: peppermint mocha coffee, wine (shh). Symptoms: sore hips, a little nausea (?!) here and there. What I am looking forward to: Third trimester -one more week! And Christmas of course. Hi! Stoppping by from MBC. Cool blog!